To make an appointment or get more information, call us at 978-449-9919. You may also email us if you have any additional questions that this website did not answer, or if you’d like to make preliminary appointment time inquiries. NOTE: We are unable to schedule an initial visit appointment via email due to the wide variety of services we offer. You may email us to let us know you are interested in scheduling and we will call you to arrange your appointment. We have many chemically sensitive patients at Groton Wellness. Please refrain from wearing fragrances on your visit, as we are a fragrance-free facility. 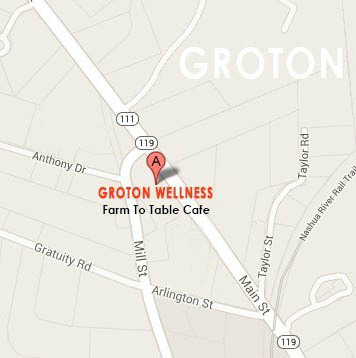 Are you a Groton Wellness patient? How was your visit to Groton Wellness? Upon scheduling your first appointment, we will collect a reservation fee (deposit) as a courtesy to both our patients and our staff. The fee will be $50.00 for Dental, $100 for Medical, and $50 for Spa (Spa appointments over $100). This fee is entirely refundable if you decide not to keep your appointment (provided you cancel or reschedule at least 48 hours prior to your appointment time and providing the Doctors have NOT done review and research of your medical history) and is applied 100% towards your appointment; it is not an additional fee on top of what you will pay for your exam. Your referral of friends and family is the greatest compliment you can give to us! Referrals are greatly appreciated and we always welcome new patients into our practice. If you have referred patients to us, please email us to confirm that we have logged each referral appropriately. Thank you for your continued support! We are honored that you entrust us to help your friends and loved ones achieve optimal health. 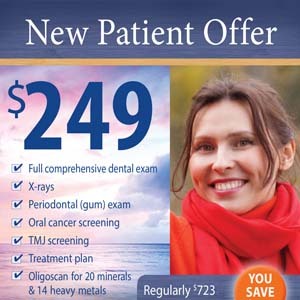 Click New Dental Patient Specials for details.